Just because this movie flopped at the theaters when it was released in 1970 doesn't mean you can't watch it for it's exquisite Norwegian scenery and spark a little Scandinavian wanderlust in your children. Kids adore musicals, and Carol Brady - I mean Florence Henderson - is in it, so what's not to love? 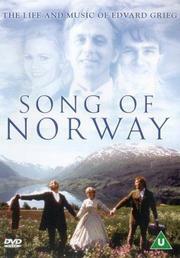 Song of Norway is a biography of Norwegian composer and pianist Edvard Grieg's early life. It tells the story of his struggles to find recognition for his classical music in the late 19th century. The songs in the movie, based on Grieg's, aren't bad, nor is the singing, but the plot is where the musical falls apart. It tries too hard to imitate The Sound of Music and just doesn't exude the same enchantment. Watch Song of Norway for the snow-capped mountains, the sweeping fjords, and the Norwegian villages, landscapes, and folk costumes, all shot on location in beautiful Scandinavia. Thanks for stopping by my blog :) Following you back!